Thomas James Sandercock | Launceston Then! Tommy Sandercock seen here with Bernard Robbins. Photo courtesy of Chris Robbins. Tommy was born on the 11th of August 1916 to Thomas James Sandercock and Edith Jane Pearce at Angel Hill, Launceston. His father Thomas was a bone grinder/general labourer. The family later moved to Dutson Cottage, Dutson, where his father then worked as a farm labourer. On leaving National School at an early age Tom went to work for Garlands Bakery on the corner of Madford Lane and Southgate Place. Here he lived and worked in the bake house and assisted in carrying out deliveries to the country with horse and cart. Eventually he took up the position as traffic controller, firstly at the bottom of Race Hill. At the outbreak of the Second World War he enlisted with the Duke of Cornwall’s Light Infantry before being transferred to the Oxford and Bucks Light Infantry. On September 8th, 1943, he married Joyce Alberta Northey at Lewtrenchard. They were to have one son, Michael. Tom was invalided out of the army and returned to his previous civilian job, this time on ‘Treleaven’s Corner’ (the junction at which the Halifax bank is now situated) where he remained for 42 years becoming the well known figure to the many thousands of people who travelled Southgate Street. 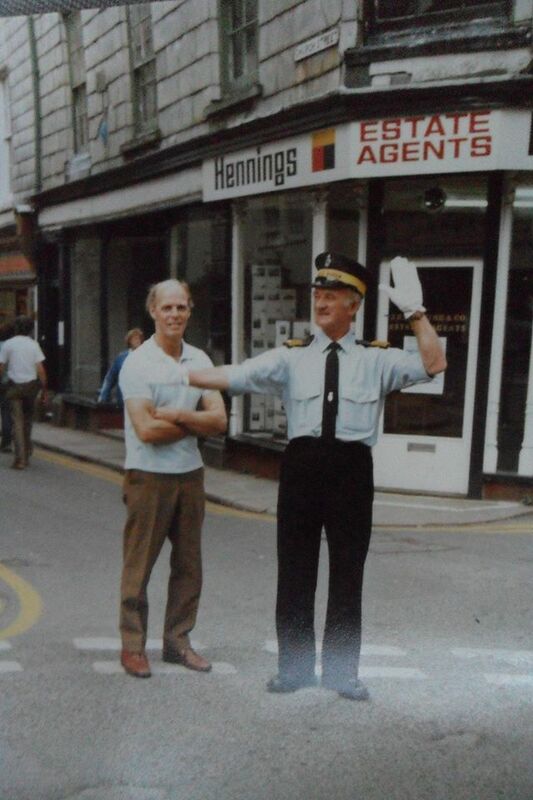 No matter the weather he was always there performing his point duty with true professionalism, especially on the busy markets days when he would give time for the various cattle lorries to negotiate the Southgate Arch. He was such a part of Launceston that in 1981 on his retirement, he was given the greatest distinction of being made the town’s first honoured burgess. After just a few months of retirement he took up the position as the car park attendant at the Health Centre then at Lower Market Street. Tom’s interests in the town were wide and varied. As well as being a loving family man he also enjoyed gardening at his home at Mount Wise, keenly exhibiting his wares at the various shows, as well as being a judge. 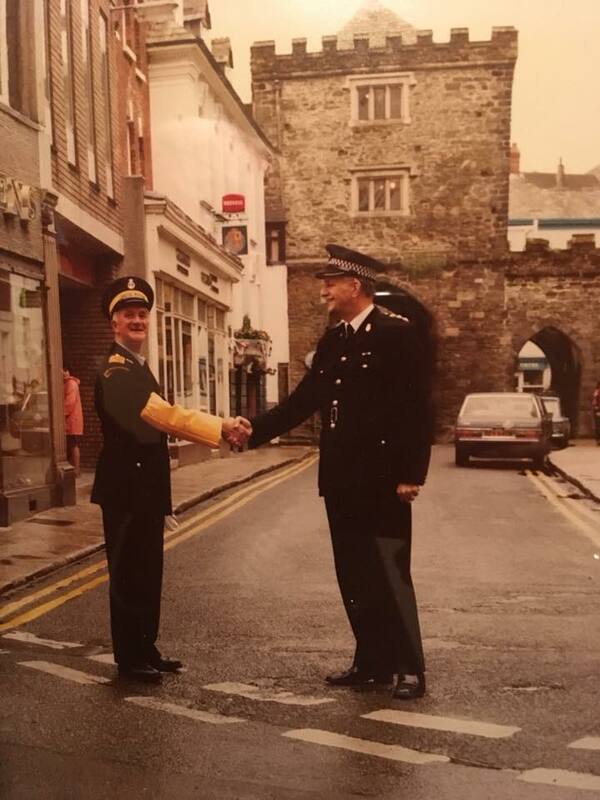 He also enjoyed singing and was a member of the Royal British Legion Choir, and the Devon and Cornwall Police Choir. Very much a churchman, he was a sidesman at St. Mary Magdalene Church for many years and had also been a member of the Launceston Brotherhood from the age of 16. Tom sadly passed away after a short illness at the beginning of November 1991 and for many was a great loss to the town being fondly remembered some 25 years after his death. At his request the funeral took place privately on Monday November 4th, followed by a service of thanksgiving in St. Mary Magdalene Church, which was filled to capacity. Rev. Timothy Newcombe conducted the service and spoke of Tom’s work and involvement in the community. 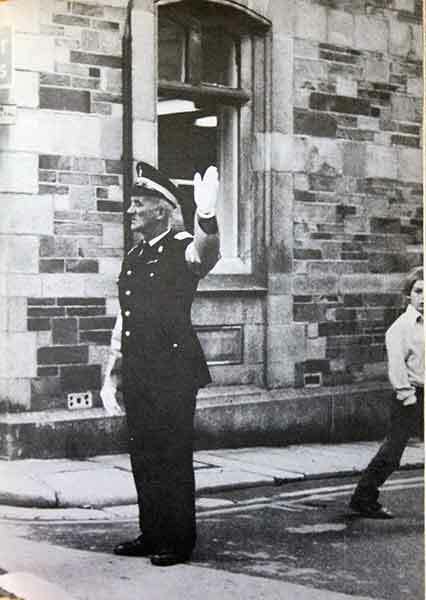 Chief Inspector Addicott and Tommy Sandercock just before his retirement in 1981. Photo courtesy of Lin Lee.